The kitchen makeover is finally done!! After living here 5 years it was time to give this space a new look, and put all my kitchen ideas into play. 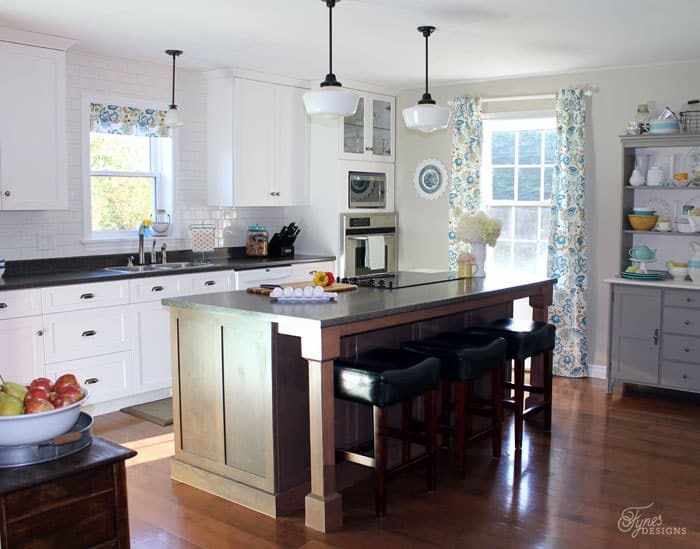 I am so excited to give you a tour of my new modern farmhouse kitchen! You can see what it looked like BEFORE here. I must start with saying that a lot of the items I used to update my kitchen were things I received from my Aunts house. She lived in a big farmhouse and I was fortunate enough to be able to have some of her things. Going through her memories was very inspiring when deciding on our kitchen decor. I hope you like it as much as I do! Yesterday I shared a preview of my baking pan gallery wall, I absolutely love it. It was the perfect solution to a pocket door wall. The aluminum pans are so light I hung them with 3M command strips. I made the faux roman shade and drapes from this fun fabric I found in the summer clearance. Can you believe I found the fabric after I chose my paint colors?! It was meant to be!! 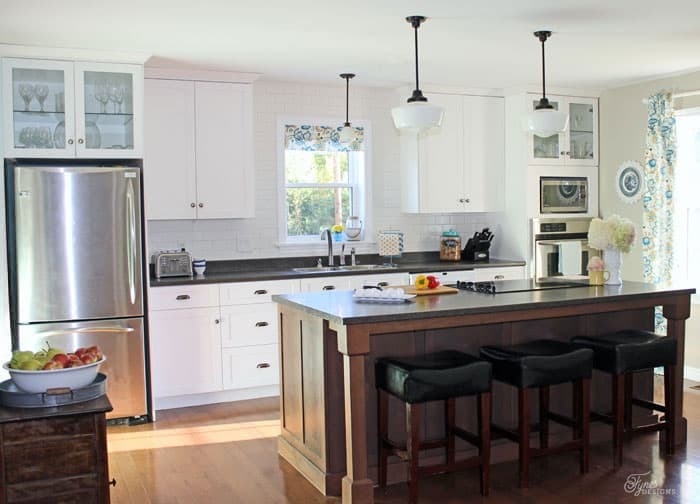 The white subway tile made the kitchen so bright and clean. I can’t tell you how much I’m in love with my new Touch2O faucet from Delta. Check out the details here. I picked up this cheap hutch on Kijiji, it was black and brown and looked very cookie-cutter. I gave it a fresh coat of PPG the Voice of Color paint and switched out the dated wood knobs for brushed pewter hardware. The Printed Tea Towel Butcher Diagram I made really compliments the rest of the kitchen decor. You can find the FREE Butcher Diagram Silhouette Cut File here. The hutch is a hearty mix of vintage and modern items. If the color fit, I went with it… with the exception of the gumball machine. The pop of red isn’t balanced very well, but I’m working on finding some more pieces to incorporate. 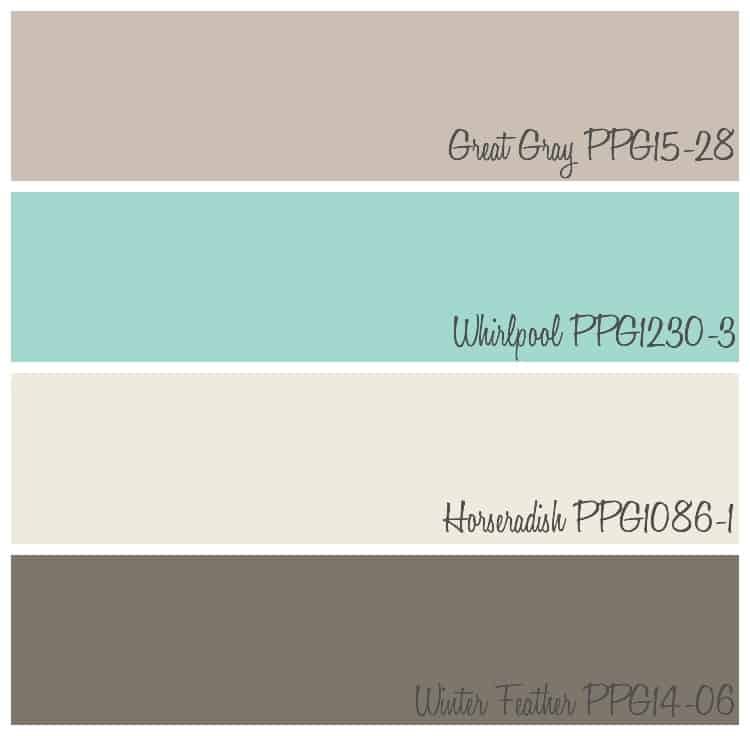 I asked you all on Facebook and the majority said they loved the cool crisp color Whirlpool for an accent wall. 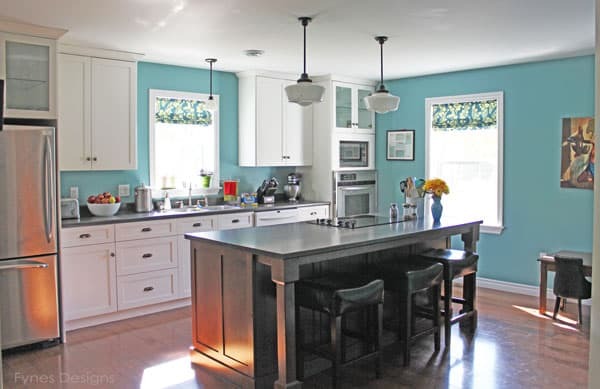 It wasn’t a huge change from the existing blue, but I love how it put a fun element into the kitchen. The opposite walls are done in Great Grey. This is becoming my new favourite neutral color. Not too bold, not too muted and perfect in every light! 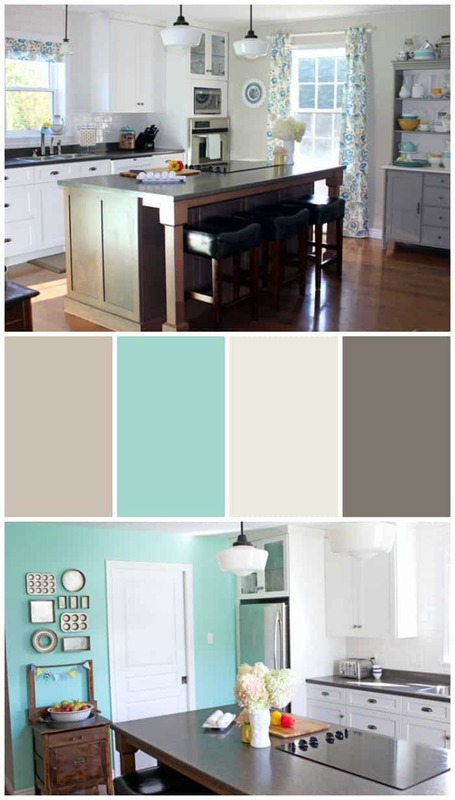 For the hutch I chose Winter Feather for the main color and Horseradish for the counter top and back. In hind sight I could have probably went a shade darker to make a more dramatic contrast, but I love how soft it is. I think it will be great when I change up the accessories with the change of the seasons and holidays. For the trim work I stuck with a clean white in Snowbank . 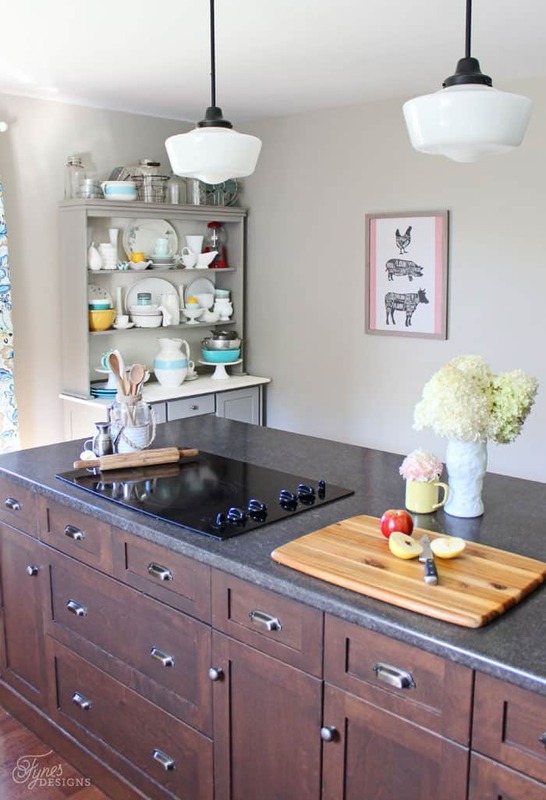 It is so hard to choose a favourite part of my kitchen makeover… the hutch, the subway tile backsplash, the vintage items, the soft colors with a pop of blue and yellow. What did you like best about the new look? I’m so happy you stopped by to check out my new kitchen look! Disclosure: PPG has provided the paint for this project. As always the opinions expressed in this blog post reflect my honest opinion. It looks fabulous Virginia!!! Everything is perfect! LOVE the hutch and how you decorated it. Beautiful. My favorite part is the hutch! I LOVE it. What do I like best? Everything!! Seriously though, that island is to die for!! And I love the collection of baking tins. Your kitchen updates look wonderful! Love your new backsplash. Gorgeous. Stunning. I Love it! You have such a fun, fresh, inviting style! Especially love how you have all of your antiques and collectible pieces displayed and how you have combined old with new. Have a Happy Weekend! Thanks so much Arien! I had a lot of fun incorporating everything together! That hutch! Looking at it is heaven!! Seriously, I think I just stared at it for 10 minutes from my desk at work…amazing Virginia! Thanks Michelle, I have to admit, i changed things around like 15 times! Love it!! 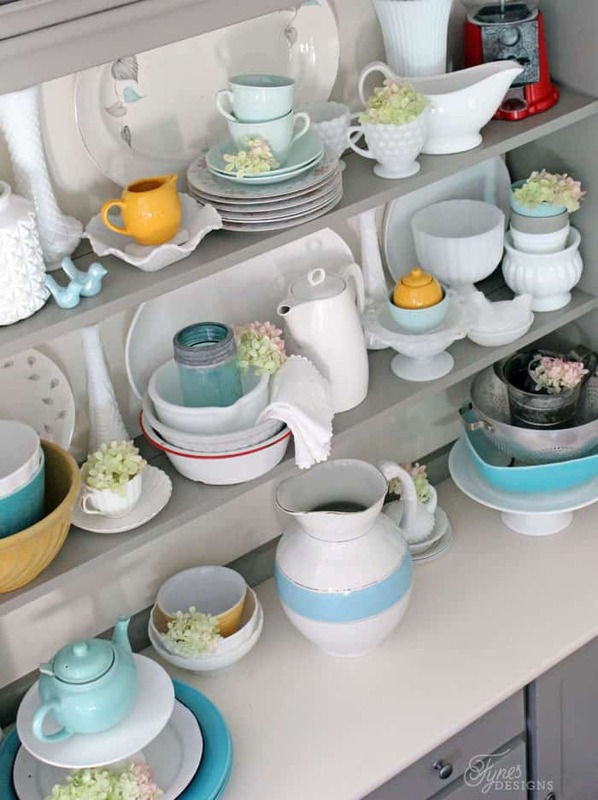 From the baking dishes on the wall, to the bunting on the dresser to the collection of dishes in that gorgeous hutch!! Keep up the good work!! Love the new look!! From the baking pan wall, to the bunting on the dresser and the lovely collection of dishes in the incredible hutch!! Keep up the good work!!! Looks fantastic! That hutch was a great score and I love the way you styled it! Silly me, I never got a before photo. The black didn’t do it any justice! 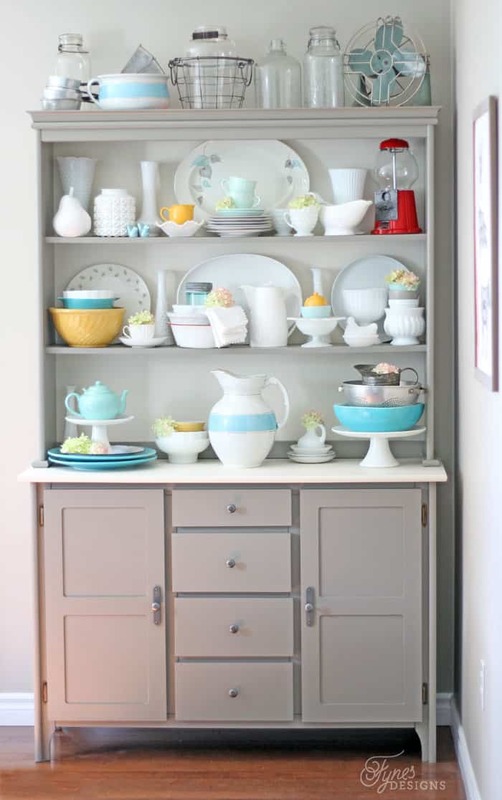 Oh, I adore that hutch with the pops of blue! Everything looks so PRETTY! 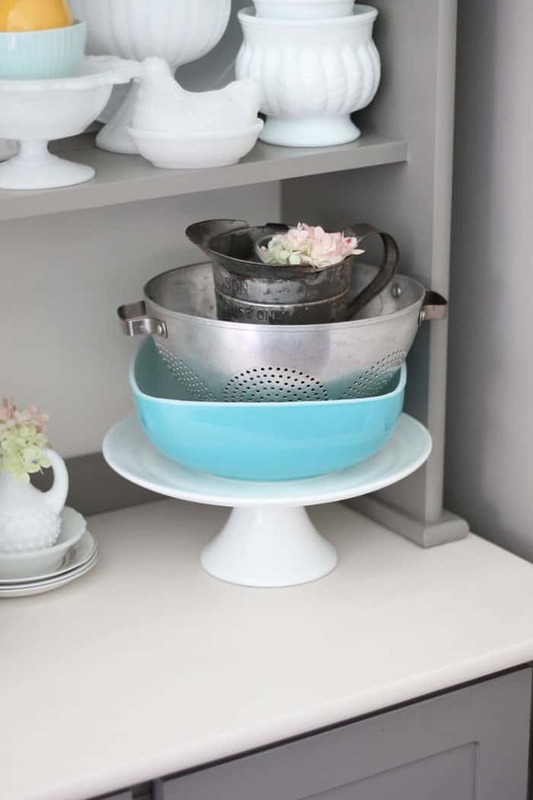 I just added a few pops of blue and mint to my open shelves but I may have to sneak some yellow in after seeing yours….I’m also loving that baking pan wall! So creative! The vintage basin was my starting point with the blue, then I stumbled upon everything else, I love how it all works together! Oh V your kitchen is AMAZING! I love the farmhouse style so much…you have done and outstanding job…and that subway tile…love! Oh my!! I love it, Virginia! It’s so happy, clean, colourful and creative. The turquoise accent wall is the perfect contrast to the light grey walls. The subway tile us awesome, and both the pan gallery wall and hutch are SO AWESOME. Great job. Pinning and sharing yourvkitcgen all over! Thanks Christina, I’m really happy how everything came together! Beautiful colours,the backsplash shows off your new curtains you designed. I really like your hatch with the new and old items against your choice of paint colours. I love all the little touches that make it “you” and those little things make it feel like home. I love your kitchen island by the way. Wow!! This looks amazing! I love the faucet. The island is gorgeous and the accent walk is a colour I would never be brave enough to use. It amazes me how some people like you find this decorating and choosing colour palettes so easy. I don’t. I struggle with colours and matching pieces and such. I tend to need help with the details. I love your baking pan wall by the way. So unique! I do find it easy… but ask me to do some Math, or read a fat book and I’m lost. The biggest tip I can share is to start with the hardest to buy thing like a rug, chair, or fabric and then draw your color selections from that! Thanks for stopping by Paula! Is that really your kitchen???? It looks like something out of a magazine…. Wait a minute, you must be a designer… LOL.. Gorgeous… Trully gorgeous. WOW! Fantastic job! I love love love the baking pan on the wall!! Looks lovely!!! So pretty and bright! I love your island and it seems to pop out so much more now! It rally does now that you point that out, I’m quite sure we spend 50% of our time at that island! Thanks for coming by! Wow that looks great! 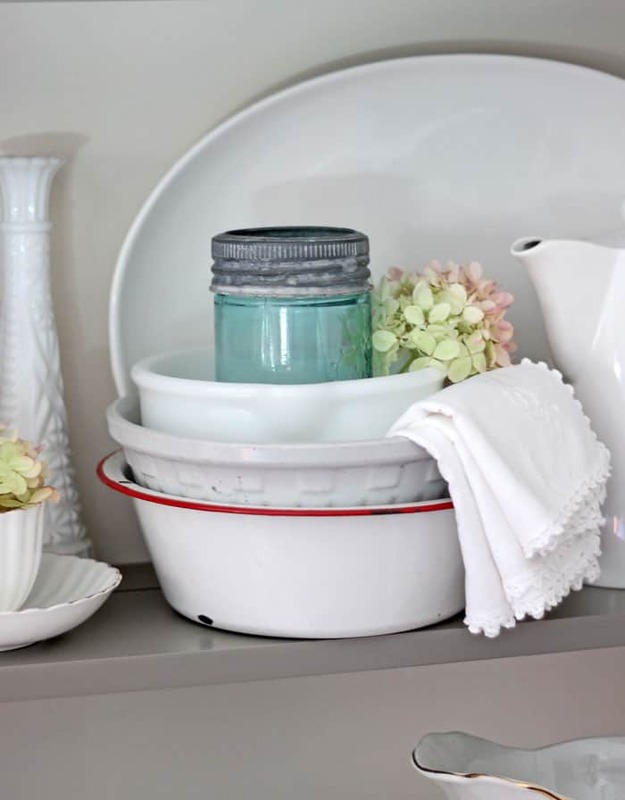 I love how you styled the hutch – so fresh and pretty. What a great space to work! So in love with pretty much EVERYTHING! 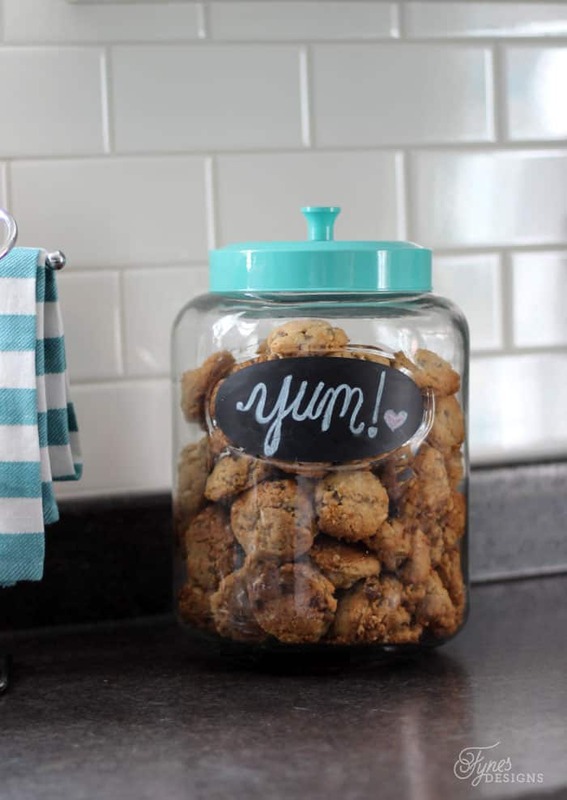 Pinning for future reference when it’s time to redo our kitchen. Thanks so much for sharing! Thanks ladies, so happy you popped by! I seriously love this so much. I want it to be my kitchen!! 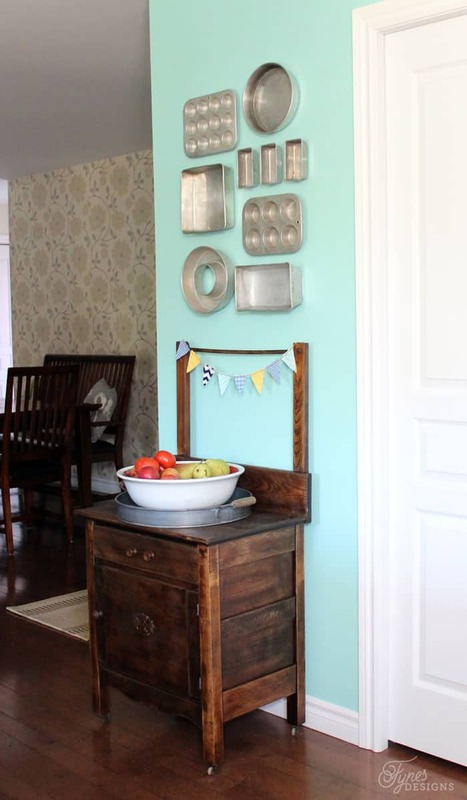 I love the baking pan gallery wall, the colours, the roman shade fabric – EVERYTHING. The space really makes me happy! Glad you like it too, Thanks for stopping by Katie! So gorgeous! I love it. Virginia – this is gorgeous! It’s so fresh and bright! The colours are fantastic! I love your hutch. It’s perfect. Thanks Tara! Can’t wait to see your kitchen too! Woah, how beautiful is that?? I like your paint colours, they go so well together and that hutch – sigh – lovely!! Thanks for swinging by Heather! I love the hutch, and you styled it so beautifully! Nice job! It looks amazing! You have a gorgeous kitchen. 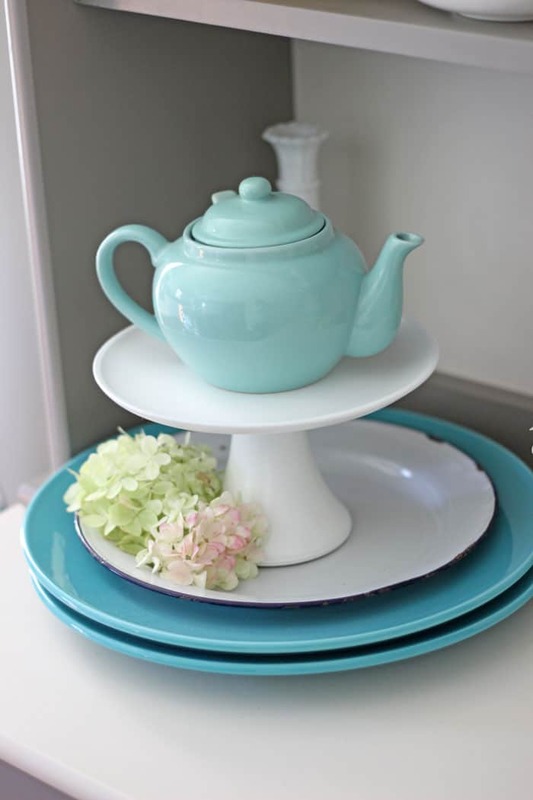 I think I’m going to have to go in search of some beautiful dishes after seeing how pretty everything looks in your hutch. Beautiful colors too. Great job!! Found you on DIY Dreamer. This kitchen is fresh, fun and practical- I love it! 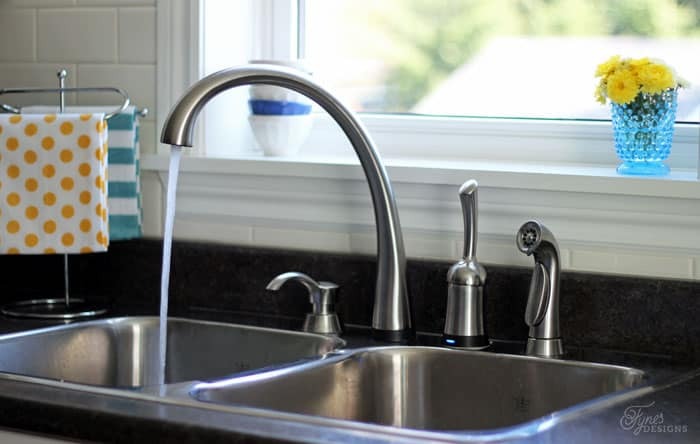 Love your kitchen reveal! Awesome job! I love both looks. The after looks great because it’s clean and fresh, but the blue was just as lovely. Love it all, especially the collection of pans on the wall! Sharing!! Beautiful transformation! Love that hutch! Guuuurrrrllll… that kitchen? AMAZING. I hope I don’t get charged for like pinning every single picture… your hutch display drives me crazy! The layers are pure art! Oh Donna, Thanks! That means so much!! Thanks for stopping by Danelle! Small world eh?! This kitchen is SO you! And so well done. Calming and warm and just beautiful touches everywhere. I love the paint colour and what you did with the hutch. I’ve always said you have this great sense of style when it comes to colours and in so many ways as soon as I saw this kitchen I thought of your instagram feed and how well it compliments it as both have the same vibe. Beautiful job! Now come over and help me with ours!! What an outstanding job. I love how bright it is! Thanks so micha or linking up to Awesome Things Tuesday! Found you via Hometalk and I’m so glad I did. 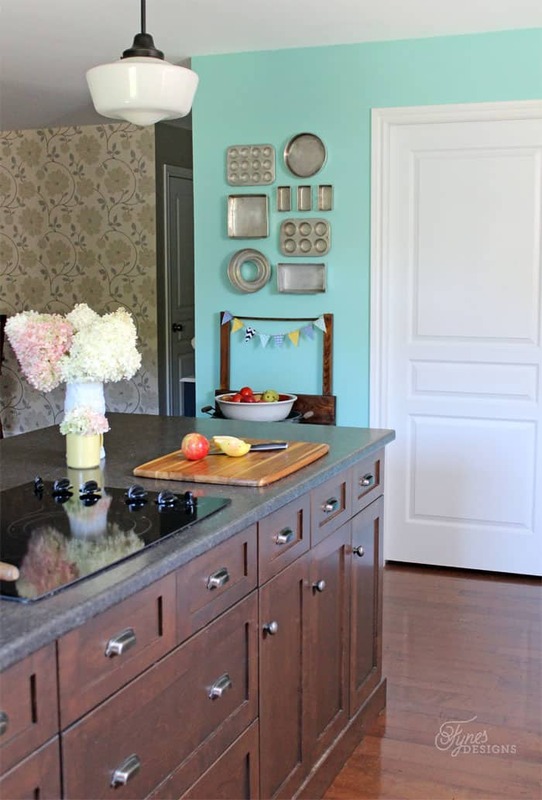 I’m loving your blog and your kitchen is pure eye candy! Thanks Michelle, I’m so glad you found me too! Stick around I have some great holiday projects coming up! 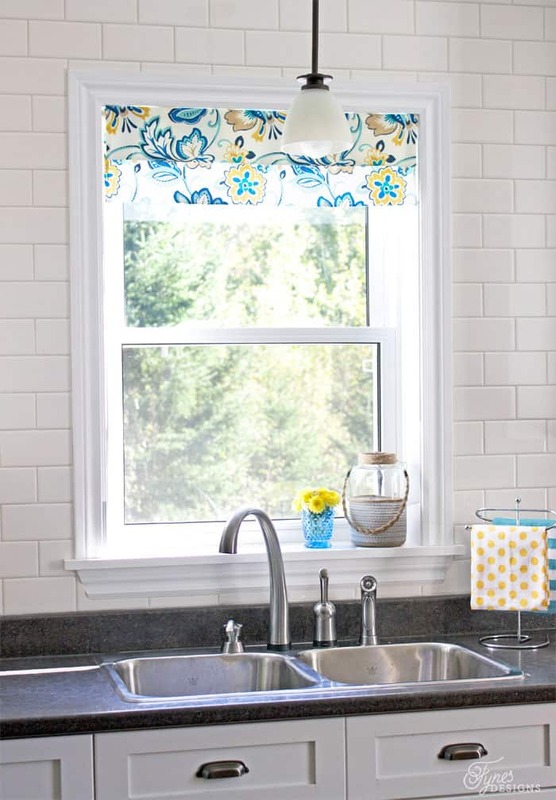 I love your pretty vintage feeling farmhouse kitchen- the fabric you chose for the blind and drapes is one of my favourite parts. What a find! We have those same light fixtures in our house!! LOVE the island but wish I could fit it in my kitchen which is rather small. You have such a talent. Thanks Carolyn! The Island is really the hub of our home! It looks fabulous. The hutch really does add more visual interest. Changing the paint color makes it look very airy. The baking pans on the wall? Seriously genius. Appreciate you bringing this by Snickerdoodle Sunday! This kitchen is AHmazing! I am featuring this tonight on the Creative Corner! Thanks for all of the eye candy! This looks gorgeous! You did such a fabulous job with every details. What a gorgeous kitchen !